Eagle’s Nest Beach Resort is an award-winning resort on Marco Island and you will have a fabulous vacation when you stay at this premier luxury resort on Florida’s southwest coast. Experience the feel of Mediterranean-style living at Eagle’s Nest’s glorious beachfront location. 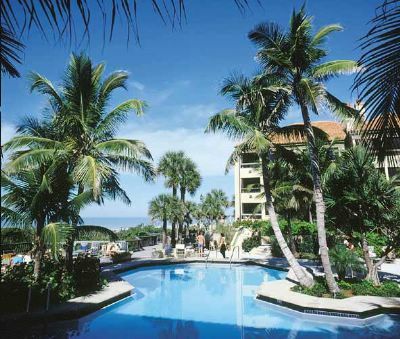 Eagle’s Nest Beach Resort is an award-winning resort on Marco Island and you will have a fabulous vacation when you stay at this premier luxury resort on Florida’s southwest coast. Experience the feel of Mediterranean-style living at Eagle’s Nest’s glorious beachfront location. A fountained courtyard garden, lush tropical landscaping, and dazzling ocean and beach panoramas are the setting for the resort’s luxurious tile-roofed condominiums. 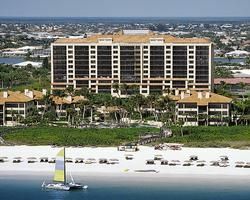 When you search for Marco Island timeshares for sale here at BuyaTimeshare.com—you will find the perfect one at Eagle’s Nest Beach Resort. 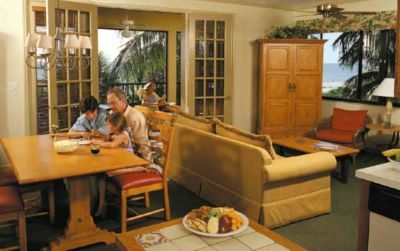 The regular upgrades made to this resort are apparent in the fresh and contemporary look of the one and two bedroom timeshares. Each beautifully composed condo features two large bathrooms with double sinks, fully equipped kitchen with dining area, living room with sleeper-sofa and LCD TV/Cable/Satellite, and DVD. A spacious, furnished balcony or patio offers even more living space and great views. All the comforts of a vacation home include a washer/dryer, IPOD/MP3 connectivity, two additional TVs, high-speed internet access, heating/air-conditioning and ceiling fans. Eagle’s Nest Beach Resort makes it easy to enjoy all that this celebrated area has to offer. The resort’s centerpiece is its grand 1700 sq. ft. swimming pool with a unique design featuring two shallow ends. Two whirlpool spas are at either end of the pool, and comfortable lounges, are shaded by umbrellas and palm trees. Buy a timeshare at Eagle’s Nest and you will also have access to two lighted tennis courts, a racquetball room, and a fitness center to help you stay in tiptop vacation shape. Several golf courses are only minutes away. Children are highly entertained with their own supervised recreational programs, and an arcade video game room. Contact Eagle's Nest Beach Resort Specialist Today!